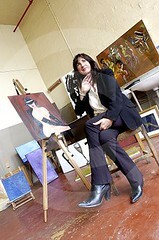 “Based near Leeds in England I work with various media including oils, pastels and ink/metallic. I am a self publishing. Liz, has visited Malta during February and March. The artist visited a number of local Artists such as Alfred Briffa, Vince Briffa and Gabriel Caruana. The artist should be exhibiting a number of work at a local gallery in the near future.